Japan was an isolated island for many centuries, which may explain how it has held onto its cultural heritage so well. 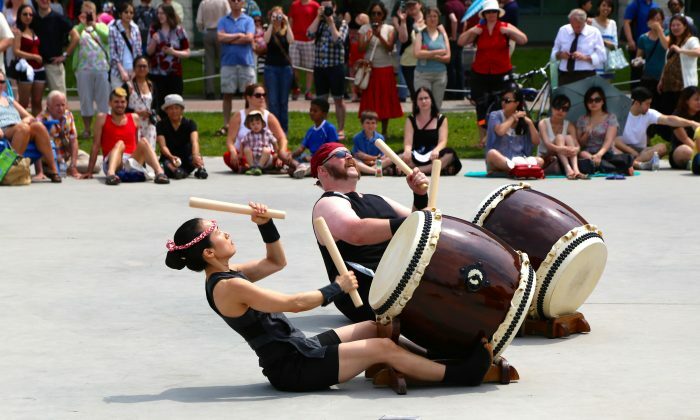 Every year, this rich heritage can be experienced at various Japanese summer festivals in cities across the country, from Vancouver to Calgary to Toronto. Ottawa held its 10th annual Japanese Natsu Matsuri (Summer Festival) on July 19, organized by the Ottawa Japanese Cultural Centre and the Japan Exchange and Teaching Alumni Association, whose members have taught English in Japan. Refined arts such as ikebana, or flower arranging, which incorporates qualities like balance, harmony, and purposeful empty spaces when putting a display together are admired around the world. The ikebana demonstration at the Ottawa festival showed four different arrangements using plants, flowers, and small tree branches to produce simple displays that were nonetheless beautiful. Musician Ryoko Itabashi, dressed in an elegant red kimono, played several songs on a tsugaru shamisen, a three-stringed instrument made of wood, thick dog hide, and tortoise shell. The pick is quite large and looks like a slightly smaller version of an ice scraper. The sound produced by the shamisen has been described as banjo-like but with a different musical scale of course. When not playing at festivals, Itabashi can be found busking in Ottawa’s Byward Market. She always wears a kimono and is often perched under a paper umbrella. Japanese folk dance group Komachi Montreal performed several dances including the Bon Odori, or Festival Dance, a traditional dance for honouring the dead. As the dancers moved around in a circle, all of the action was in the hands, which are used to convey daily activities or work performed, such as fishing or mining. The group performed both serene dances with little footwork and others that were more lively as the dancers criss-crossed the stage to show interaction with ancestral spirits or community activities. In two dances the performers wore straw hats that were angled over their faces to make them, and the dance, appear more mysterious. The various styles of Japanese dance started over 1,000 years ago and have been passed down through the generations. There are many dances, and each region has its own repertoire of dance movements that sometimes incorporate fans or small clappers. The Oto-Wa Taiko Japanese drumming group (the character for oto means sound, wa means harmony, and taiko means big drum) gave a spirited performance of traditional drumming using different sizes of drums that required different positions while playing. For example, in one piece the drummers sat on the ground and straddled a big drum as they leaned far back so they could play using large wooden drumsticks. Enthusiastic playing by Yurika, the only female in the group, included jumping up and calling out in Japanese. Originally, taiko drummers would play for religious festivals and sometimes during battles to inspire the soldiers and intimidate the enemy. More recently, taiko has become a performance art and is played in concerts around the world. In addition to the traditional arts at the Ottawa Japanese festival, there were calligraphy and origami demonstrations and a section where people could don a huge padded suit and try sumo wrestling.